↑ 1.0 1.1 1.2 1.3 1.4 1.5 "จอมซนแห่งเกาะชวา". ไทยพีบีเอส. 26 May 2014. สืบค้นเมื่อ 26 May 2014. ↑ Appendices I, II and III" (PDF). Convention on International Trade in Endangered Species of Wild Fauna and Flora (CITES). 2010. http://www.cites.org/eng/app/Appendices-E.pdf. ↑ Wilson, D. E., & Reeder, D. M. (editors) (2005). Mammal Species of the World — A Taxonomic and Geographic Reference. Third edition. ISBN 0-8018-8221-4. ↑ "Table 2 b: taxonomic names and synonyms used by several authors: genus, species, subspecies, populations" (PDF). Loris and potto conservation database. loris-conservation.org. 4 February 2003. p. 3. สืบค้นเมื่อ 30 April 2013. ↑ "Synonyms of Slow Lorises (Nycticebus)". Encyclopedia of Life. eol.org. สืบค้นเมื่อ 30 April 2013. ↑ Elliot, Daniel Giraud (1913). A Review of the Primates. Monograph series, no. 1. New York, New York: American Museum of Natural History. OCLC 1282520. ↑ Ankel-Simons, F. (2007). Primate Anatomy (3rd ed.). San Diego, California: Academic Press. ISBN 0-12-372576-3. ↑ Nekaris, Anna (23 January 2013). 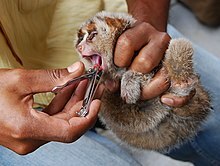 "Experts gather to tackle slow loris trade". Prof Anna Nekaris' Little Fireface Project. nocturama.org. สืบค้นเมื่อ 30 April 2013. Anna Nekaris, ... who described the new Kayan slow loris, presented the results of her research highlighting the differences between the species. ↑ 16.0 16.1 "ยังไม่ทันได้รู้จักก็จะสูญพันธุ์เสียแล้ว". ผู้จัดการออนไลน์. ↑ "การละเล่นลิงลม". 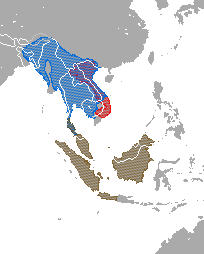 thaiethnicity.com. สืบค้นเมื่อ 26 May 2014. หน้านี้แก้ไขล่าสุดเมื่อวันที่ 3 มกราคม 2562 เวลา 12:18 น.